One of the most tell-tale signs or stigmata of facelifts are obvious scars. Many potential candidates who would achieve excellent, natural and refreshed results become hesitant about having a facelift or similar procedure because they have a friend, family member, or maybe seen a passer­-by with obvious scars around the ears or temples. 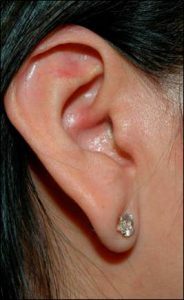 The pictures below demonstrate unfortunate results (performed elsewhere) with “pulled-down” ear lobes and very obvious scars. 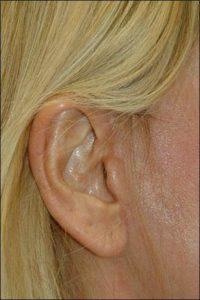 These types of scars are preventable and the techniques I use ensures they do not occur. To achieve results without obvious scars, the astute facial plastic surgeon should perform at least these four steps. 1. Design the incision correctly to maximize the incisions invisibility. 2. Tighten the so called SMAS (“muscle layer”) after releasing it properly. 3. Tension free closure of the skin, using two layers of sutures. 4. Take the time to suture the incision properly, using magnification. 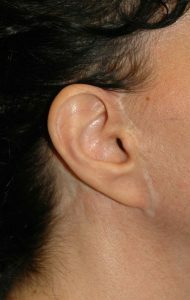 The pictures above illustrate how incisions for a facelift can be made and later closed with a resulting scar that is imperceptible, even on very close inspection. To learn more about facelifts and other facial rejuvenation procedures click here to jump to our section that discussing facelifting procedures in more detail. And click here to see more post-operative facelift incisions.